Welcome to GoY, Lovely colourful garden. This is a pretty garden. You have a beautiful garden Khayla. Welcome from me to. ` looks lovely~roll on spring and summer! Beautiful Khayla, lovely colours. I love perennials too, but I do agree that summer bedding can be really good for gaps. I hope you are as pleased with it as we are! Thats lovely and what a transformation from the last photo! WOW your garden looks beautiful. Wow Khayla, It looks stunning! thank you dylandog, hope it looks as good this year, I have been some plants to give it some colour until the others come in the summer. thank you all, and welcome to the Goy new members. What a treat to see your lovely garden. The tree/shrub in the right hand bottom corner is a wonderful shape. 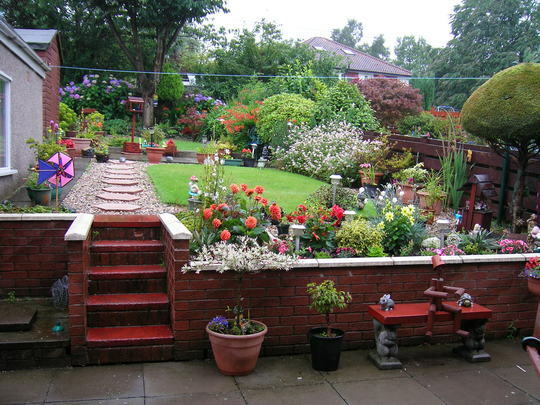 What a lovely neat garden, what a lot of work you've done compared to the "before" photo! lovely, what did you use to get the steps red? Hi doddy,I used outdoor step paint,I used the same on my concrete garage floor. Thank you welshy,I think I have set the garden so its a bit easier to manage . It may have taken u 15 yrs. but I can see that the result is lovely u can enjoy it now alright! thanks anchorman,looking out my window and its the same as the snow one from last year,looks nice for a wee while then you miss the greenery.